The Perez family at their new Ironbridge teacher rental unit. It’s a special Christmas in a new home for about two dozen Roaring Fork School District teachers and staff members and their families. Roaring Fork Schools officially launched its affordable staff housing program at the beginning of this school year. Staff members who qualified for the program moved into all 23 of the finished housing units at Willits in Basalt and Ironbridge near Glenwood Springs in September and October. Already, they are seeing the benefits in their housing situations, where before it had been difficult for them to remain in the district due to the high cost of housing in Roaring Fork Valley communities. The affordable teacher housing opportunity was made possible by voter approval of the district’s 2015 bond issue. The $122 million bond package included $15 million for the acquisition or construction of at least 15 rental units for teachers in each of the three communities. Those housing units have made staying in the valley to work for the Roaring Fork Schools more feasible for some established staff members, and are expected to make it easier to hire new teachers to come into the district. Nicole Forristal joined the Roaring Fork Schools team as a kindergarten teacher five years ago and quickly faced the affordable housing challenge. Forristal moved into one of housing units at Willits earlier this year. 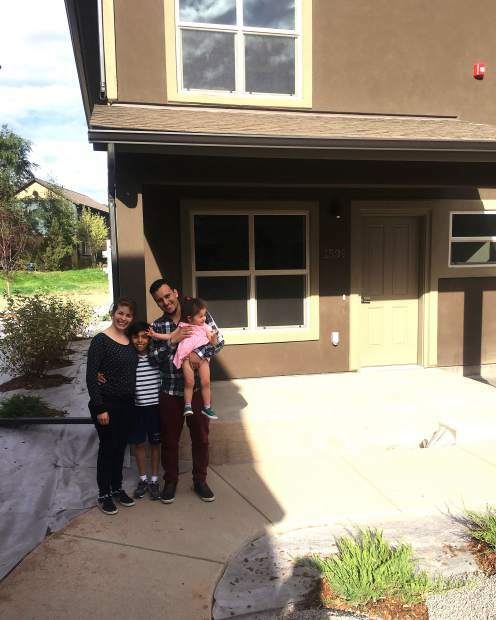 “Before staff housing became available, we feared that we would have to relocate back to Denver so that we could afford to own a house once again,” Forristal explained. “When affordable staff housing became a reality, we decided to apply so that we could be able to pay our bills and actually have money to save for the future. “In just the short time that we’ve lived in staff housing, we’ve saved so much on gas alone because our commute is no longer an hour long,” she said of having to settle for less-expensive housing farther downvalley. The ability to save for the future is a common theme for many staff now living in the district’s affordable housing. Rob Norville joined the Roaring Fork Schools nine years ago. Both he and his wife teach in the Glenwood Springs schools and had been commuting from New Castle. “When we learned that there would be three-bedroom units available in Glenwood Springs, we saw it as our best opportunity to be able to live in the community where we worked, while still being able to save some money for the future, so we applied,” Norville explained. Norville also noted the positive impact on his family of living in the same community where his daughters attend school. Forristal’s children have been enjoying the same benefits from living where they attend school. “We have been able to set up more play dates for our children because they’re closer to their friends now,” she said. Additional housing units currently under construction on district-owned property in Carbondale and at Cardiff Mesa in Glenwood Springs have already been assigned through a staff lottery that was held last spring. These housing units are on schedule to be completed in the summer and fall of 2018. Going forward, the district will continue to assess how to improve and build upon the affordable staff housing program by engaging the staff housing committee for an annual review process. The taxpayer investment is already making a big difference, he said.